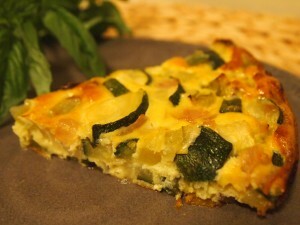 This dish balances the mild sourness of green tomatoes with sweet carrots and basil to create a flavorful spring quiche. Heat olive oil over medium heat in a large skillet. Add onion and saute until onions begin to brown, about five minutes. Add garlic, green tomatoes, and carrots. Cook until tomatoes begin to soften slightly, about two minutes. Add zucchini to the saute and continue cooking until all of the vegetables are tender, three to five minutes. Remove from heat and incorporate the basil. Salt to taste, then set aside. Crack the eggs into a small glass bowl and beat until the yokes and whites are evenly blended. Coat a nine inch pie dish with non-stick cooking spray. Add the vegetable saute into the dish and pour the egg mixture evenly over the vegetables. Bake at 350 degrees until the eggs have thoroughly set, about 20 minutes. Serve warm with Green Tomato Aji.